As a language arts teacher, grammar is near and dear to my heart. While I occasionally slip up and make mistakes myself (we're all human, right?! ), there are some words that just shouldn't be confused. 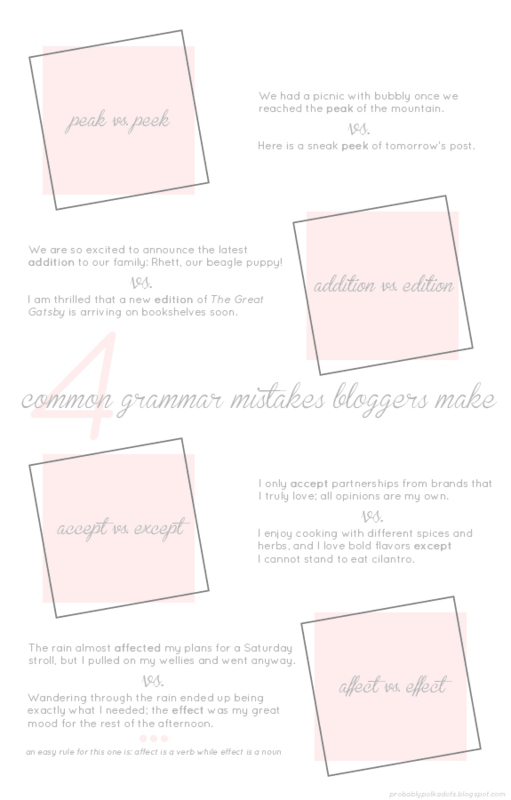 Over the past few weeks, I've been keeping a list of the mistakes that I see most commonly. I hope this list, the examples, and the tricks help you avoid making these errors in the future. It's a harsh grammatical world out there, y'all! One final tip: when in doubt, just use an alternative word. I am a terrible speller (oh the ironies in life), so I will typically use a different word if I am unsure. And be mindful of spell-check; it is not always accurate, especially with words like "effect & affect". What grammar rules and words do you struggle with? this post rocks. that is all.